SHOWS: COBHAM, ENGLAND, UK (FEBRUARY 20, 2019) (REUTERS - ACCESS ALL) 1. (SOUNDBITE) (English) MAURIZIO SARRI, CHELSEA MANAGER, SAYING: "I have to think that I will be the manager of Chelsea for a long time, otherwise I cannot work. REPORTER ASKS IF SARRI IS CONFIDENT THAT HIS STYLE OF FOOTBALL WILL WORK EVENTUALLY: "I am not sure but I have to think this of course. Becuse I want to work and I have to work with a long-range target" 2. 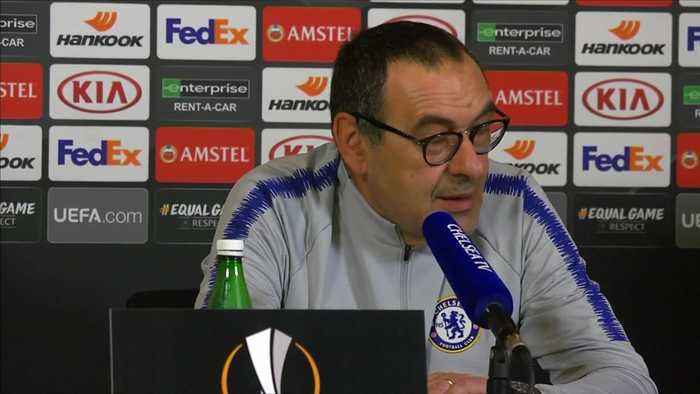 (SOUNDBITE) (English) MAURIZIO SARRI, CHELSEA MANAGER REPLYING TO A QUESTION ASKING IF HE HAS SPOKEN TO CLUB OWNER ROMAN ABRAMOVICH, SAYING "No, not in this week." 3. (SOUNDBITE) (English) MAURIZIO SARRI, CHELSEA MANAGER, SAYING: "The system is a false problem. I know very well that when we loseI have to put a striker on the pitch, and when we win I have to put a defender on the pitch, but I want to see fottball in another way." 4. (SOUNDBITE) (English) MAURIZIO SARRI, CHELSEA MANAGER, SAYING: "It depends on how you see football. In that position I want to play, able to move the ball very fast and this is not the best characteristic of N'Golo (Kante)." STORY: Chelsea manager Maurizio Sarri is planning for the long-term despite the club's fans booing his side during Monday's (February 18) FA Cup defeat by Manchester United at Stamford Bridge which has fanned media speculation about his future. "I have to think that I will be the manager of Chelsea for a long time, otherwise I cannot work... I'm not sure but I have to think this," Sarri told a news conference ahead of the League Cup final against Manchester City at Wembley on Sunday. The Italian defended his decision to play N'Golo Kante in a more advanced position, saying the French World Cup winner is not suited to moving the ball quickly from deep areas that is central to Sarri's style of play. Chelsea had looked like title contenders when the Italian guided them to a 12-game unbeaten Premier League run but six defeats in their last 14 league games -- including a 6-0 reverse at champions City -- has seen the club drop out of the top four. The 2-0 defeat by United that saw holders Chelsea exit the FA Cup in the fifth round led some supporters to chant that their coach faced being "sacked in the morning" just seven months after Sarri arrived at the club.